President Macky Sall of Senegal has urged African countries to invest more resources into health to address the health challenges facing the continent. He made the remarks while addressing delegates at the WHO Regional Committee – the annual meeting of health ministers from the 47 countries in the WHO African Region. The Senegalese leader pointed out that with the support of technical and financial partners, much progress has been made particularly in controlling and managing communicable diseases. He how-ever drew attention to the growing burden of noncommunicable diseases (NCDs) and emergencies and called for firm action to address them. He said: “NCDs and other epidemic outbreaks are revealing the weakness in our general health systems and indeed surveillance systems. Africa suffers if these epidemics and the NCDs are not effectively managed”. In his remarks, the Director-General of the World Health Organization (WHO) Dr Tedros Adhanom Ghebreyesus told the delegates that stronger political commitment, partnership, and a transformed WHO are key to improving health and wellbeing of all people in the world, especially in Africa. He observed that there are very positive signs of political commitment in some of the countries adding that ultimately it is the political leaders that will achieve the “triple billion” targets of the 13th Gen-eral Programme of Work and ultimately the Sustainable Development Goals (SDGs). “It’s you as po-litical leaders who are accountable for the decisions you make and the results you achieve. WHO’s role is to give you the best support we can”, he said. He reminded delegates that to achieve the SDGs, there is need for innovative, dynamic and purpose-ful partnerships. According to Dr Tedros, achievement of SDG 3 will be through effective coordina-tion of collective efforts. “It will not happen if all of us just do our own thing. It will not happen if fragmentation and duplication continue. But it can happen if we work together. It can happen if the array of actors on the global health stage leverage their collective strength” he said. The Director-General noted that there were achievements to celebrate but also challenges to ad-dress in the area of Universal Health Coverage. He informed delegates that if nothing is done about the health workforce now, the world will face a shortfall of 18 million health workers by 2030 and six million of these will be in Africa. “That shortfall not only leaves people without support for their eve-ryday health needs, it leaves a huge hole in the region’s defences against outbreaks and other emer-gencies” he said. Investing in health workers is therefore not only an investment in a healthier Africa, it’s an investment in a safer Africa. In her speech, the WHO Regional Director for Africa, Dr Matshidiso Moeti, noted that 2018 was a significant year for public health, with 70 years of WHO’s existence, and 40 years since the Alma Ata declaration on primary Health Care, the principles of which are embodied in the Universal Health Coverage. She informed delegates that the reforms in the Health Emergencies Programme were showing results as evidenced by the work of WHO with Member States and partners to contain more than 130 outbreaks and emergencies in 35 countries in the Region over the past year. The Regional Director observed that the Transformation Agenda of the African Region is making a difference in people’s lives, particularly at the country level. She emphasized that action was needed from all stakeholders to address the continued high maternal and newborn mortality, the plateaued progress on malaria control and the stagnation of Immunization coverage as well as the increasing burden of noncommunicable diseases in the Region. Dr Moeti pointed out that noncommunicable diseases (NCDs) are silently killing Africans from all walks of life – yet are entirely preventable. The Region has the highest levels of hypertension in the world – about 30% of adults suffer from high blood pressure – and approximately 146 000 adults die every year from tobacco-related diseases. “NCDs must become a priority now. Proven public health policies exist, such as increased taxation, banning advertising, having mandatory health warnings for tobacco products and alcohol, and multi-sectoral action,” she said. The outgoing Chairman of the WHO Regional Committee and Minister of Health and Child Care of Zimbabwe, Dr David Parirenyatwa thanked Member States of the WHO African Region for entrusting him with the responsibility of serving as the Chairman of the Regional Committee and subsequently the president of the WHA 70. He reported that during his tenure of office, he encouraged Member States to heed the call by the WHO Director General to accelerate and advance towards the attainment of Universal Health Coverage (UHC). A one-minute silence was observed in honour of Mr Kofi Annan, the former UN Secretary-General. 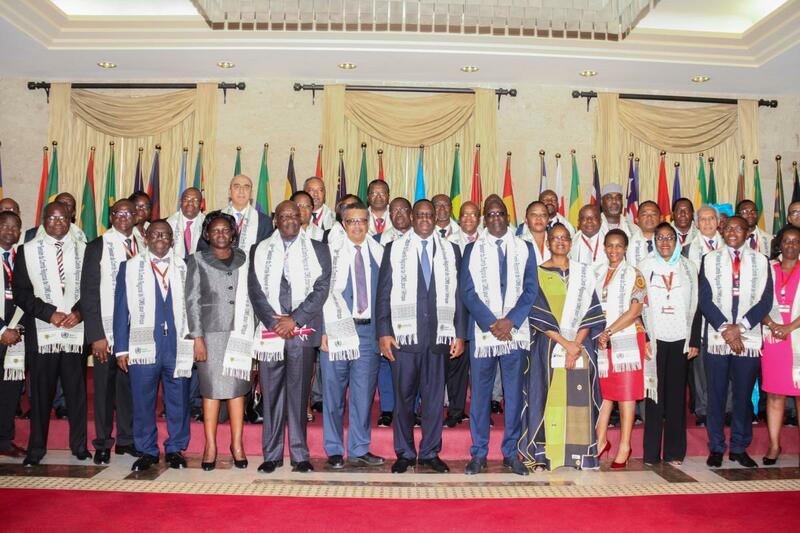 The 5-day conference is attended by Health Ministers and high-ranking health officials from 47 coun-tries in the WHO African Region.